LKV-HM3.0 dual H-bridge DC motor driver board using ST's L298N typical dual H-bridge DC motor driver IC, which can be used to drive DC motors or bipolar stepper motors. This driver board is small, light weight, but with a strong drive capability: 2A peak current and peak voltage of 46V.Although the chip with the automatic shut-off function when it is overheating , but installing the heat sink could make the chip temperature decreases, so that the drive performance is more stable. Board has two current feedback detection interface to take power within the logic selects the terminal, four pull-up resistor selection terminal, 2-way and four-wire interfaces DC two-phase stepper motor interface, control motor direction indicator, four standard fixed mounting holes. 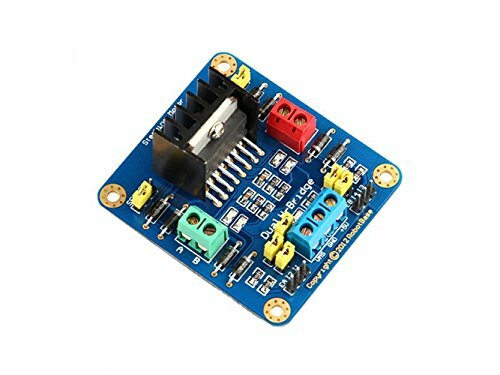 This driver board could be used with smart programmable trolley, wheeled robots and variety of controllers. View More In Electric Motors. If you have any questions about this product by ALSR, contact us by completing and submitting the form below. If you are looking for a specif part number, please include it with your message.